Through the invitation of Bishop Patrick Dunn DD of the Diocese of Auckland, the MSP was able to start its mission in New Zealand. It was in June 1996 when Fr Manuel Jadraque MSP arrived in the country. After a short stint as assistant Parish Priest of St. Michael in Remuera, he was later appointed Parish Priest of Immaculate Conception in Ellerslie. In 1998, Fr Jose Gerome Hernandez MSP joined him. With the election of Fr Jadraque as MSP Father Moderator in 1999, Fr Roberto Ruben Elago MSP took his place in New Zealand. Later, Fr Reynaldo Getalado MSP came and was assigned in a parish in Waitaruke, north of Auckland. Aside from the parish pastoral work, the MSP missionaries are involved in Filipino migrant work and some tribal ministries. 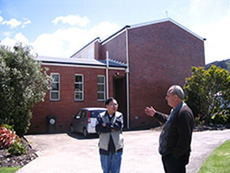 In 2005, the MSP left Ellerslie and transferred to the Good Shepherd Parish in Balmoral. In May 2007, the MSP celebrated its 10th anniversary of its apostolate with the Auckland Catholic Filipino Chaplaincy. Outside Auckland, there are two more parishes assigned to the MSP: one in Dargaville, where Fr Oliver Aro MSP was assigned and one in Thames, where Fr Ronelo Resco MSP ministered. In late 2007, the MSP accepted the apostolate for the Maoris. In early 2008, Fr Ricardo Bugas Jr MSP arrived and he was designated as priest-in-charge of the Maori Apostolate in the diocese. Later, Fr Aro was transferred to the city parish in Papatoetoe. In 2009, the MSP has accepted the invitation to work in the Diocese of Dunedin. The first MSP in that diocese is Fr Ronelo Resco. Fr Catalino Miranda joined him later. In 2012, Fr Resco ended his contract in that diocese. Then Fr Fredy Permentilla was sent to the diocese in July 2012.